An important domain of paleontological research is the creation of hand-drawn artistic images of small fossil specimens. 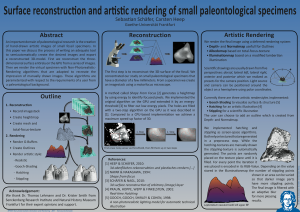 In this paper we discuss the process of writing an adequate tool to semi- automatically create the desired images and export a reconstructed 3D-model. First we reconstruct the three-dimensional surface en- tirely on the GPU from a series of images. Then we render the vir- tual specimen with Non-Photorealistic-Rendering algorithms that are adapted to recreate the impression of manually drawn images. These algorithms are parameterized with respect to the require- ments of a user from a paleontological background. This entry was posted in NPR, Publication, Research and tagged GPU, Poster on December 19, 2012 by numb3r23.